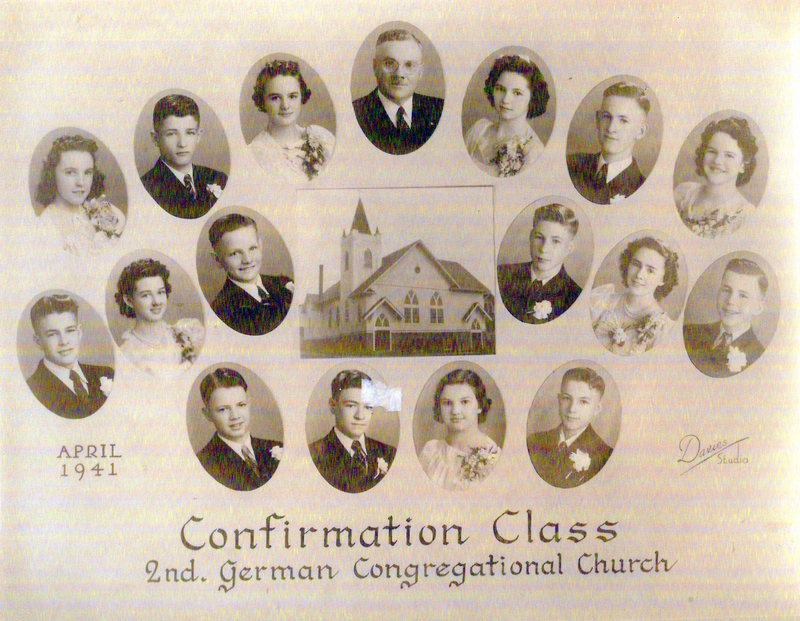 The Second German Congregational Church Confirmation Class of April 6, 1941. Top row from left to right: ?, ?, ?, Rev. Heinrich Hagelganz, ?, ?, ? Middle row from left to right: ?, ?, ?, ?, Lillian Schmer, ? Back row from left to right: ?, ?, ?, ? Not identified: Marian Krening, Doris Ehrlich, Lillian Newport, Elenor Axt, Martha Greb, Ruth Adams, Theodor Miller, Melvin Stang, Robert Ruff, William Nuss, Paul Koch, Henry Miller, Kenneth Hergert, Edward Steinmetz, Lewis G. Hahn. Photograph courtesy of Lillian Lawrence (née Schmer) who identified herself.